Any piece of advice on writing, in whatever form it is given; be it by book, article, website, blog post, You Tube video, lecture, Face Book listicle, graffiti tag, or note from your mom, will have as Item 1 – writers must read widely and voraciously to be any good. 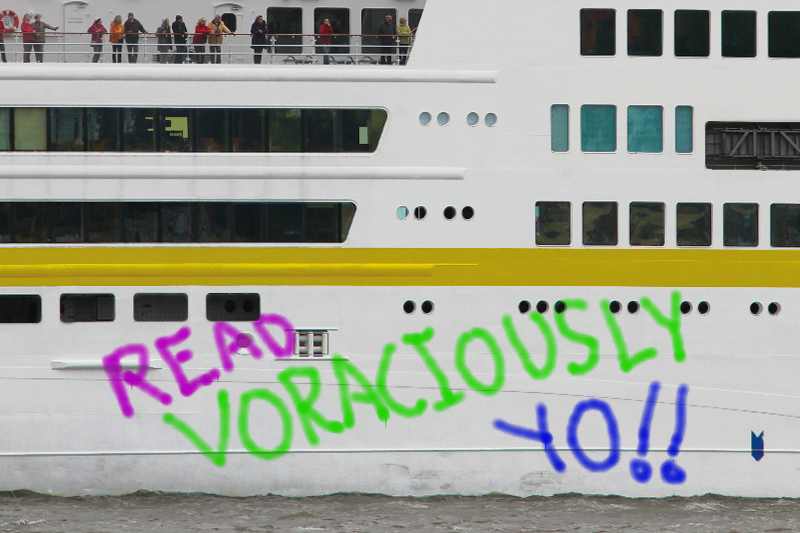 Ironically (given that reading is supposed to expand one’s vocabulary) it is apparently impossible to talk about reading a large number of books without employing the word ‘voraciously.’ It’s embarrassing really. You’ll get no argument from me about the need to read. If I had not read omnivorously and gluttonously as a kid, I would not have wanted to do so as a young adult, and so, as an old adult, I would not want to write now; I’m certain of this. Although a love of hearing stories had been instilled in me as an infant, as a child I was effectively forced into reading by virtue of the fact that my father, did not believe in television. We simply didn’t have one in the house when we were very young, and while he relented for a few years when my brother and I were around 10-11, he always kept a tight rein on what we could watch; and I mean very tight… like, it begins with Sesame Street and ends with The Muppets. Still, it was the highlight of our evenings for a time. Then one day the television set disappeared; just vanished. When questioned, Dad said that it had suddenly broken and so had been sent to ‘the repair shop.’ With mounting desperation, we asked after the TV repeatedly every night for a week, untill finally, clearly under pressure to come up with a plausible excuse, he told us that some masked bandit had smashed his way into ‘the repair shop’ and stolen it. And that was it for TV in the Ransom household. There wasn’t to be one under our roof again till we both had finished school. And so we turned to books. We read everything we could get, and we were given all the books we wanted. We started on the Nancy Drew and Hardy Boys mystery series, and read all 10 thousand of them. If it was a weekend, a new mystery book would last a day. I read everything Stephen King wrote between 1980 and 1985, twice. I read the Lord of the Rings trilogy three times. I read the Hitchhiker’s Guide to the Galaxy series at least 4 times. I read H.G. Wells, Mary Shelley, Louis Stevenson, and all kinds of mind bending Sci-Fi I can’t even remember the names of now. I read Jonathan Livingston Seagull, The Little Prince, Calvin and Hobbes, and Bloom County (this cartoon is so funny, that just writing the name here makes me laugh). I was pretty much always reading when I was younger, and I’m happy to say that the habit has stayed with me. Although there was a significant period during which I read a lot of pop science, fiction is where it’s really at for me – mind-blowing facts can move me, but only great fiction can take my whole being out for a ride. The process of reading can change though, when you aspire to write. You begin to keep one eye open for usable quotes, interesting transitions, new words. In short, you begin to look for ideas and techniques for your own work. Surprisingly, for me anyway, this does not take anything away for the experience of reading. In fact, in a way, it adds to it. You develop a deeper awareness of just how brilliant what you’re reading really is; how subtly it moves you from place to place, how artfully it works your emotions. This new approach to reading can create problems though, because some books are just so goddamn intimidating; and the more one learns to appreciate them, the greater the potential for intimidation. Some writers are just so astoundingly, jaw droppingly good, that to believe I could ever be their equal just seems absurd. I watched a movie recently in which the main character, a writer, discovers a drug (NZT? QZB? … some Z based acronym) that activates his entire brain all at once, affording him maximum cerebral brilliance. He pops a pill, and two minutes later his brain lights up like one of those solar power farms with a thousand reflective dishes all focusing sunlight on a single spot. 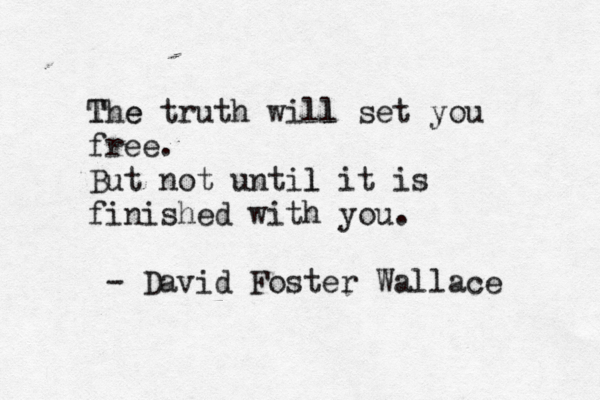 If David Foster Wallace was taking ZZT by the fist-full for the entire 10 years it took to write Infinite Jest, it would go a long way to explaining how the hell he did it. Multiple conjunctions at the start of independent clauses. The book is long; often referred to as ‘encyclopedic.’ It is diverse. It is complexly inter-woven to the point that you frequently need to shrug your shoulders and move on, trusting that what you just read will be explained to you later. The depth of vocabulary is, at least initially, outright unbelievable: one needs a dictionary to hand the entire time to truly understand it. It is utterly brilliant – full of the type of insights that a writer must write down, and packed with perfectly timed humour. I doubt I will ever read another book that will teach me so much about writing, and what is possible with writing. Having said this, on the other side of the coin, there is literature that is simply uninspiring. It may not be bad in any technical or objective sense, but it just doesn’t resonate for me for whatever reason. There are many ‘Classic’, ‘Must Read’ books that fall into this category. Recommendations are fantastic, but these days I readily dismiss them if the book doesn’t grab me. I’ll never read much of Proust for example, and I’m fine with that. Life is too short to read a book you find to be dull. There are way too many good books out there – many of them not yet written – for me to spend even an hour on a book that doesn’t draw me in immediately and keep me entranced. I have a stack of very promising books next to my bed right now, but should any one of them disappoint, I also keep a rubbish bin to hand, and I’m not afraid to use it – my limited remaining time is too valuable. I plan to read great books from now until I die, and I know that the stack by my bed will never run dry. Must writers read? I think the question is pertinent, and my answer is that they must have read. There has to be a store of information and vicarious experiences from which to form new ideas. At the same time, I think that reading too much during the creative process can cause interference. It’s good to see where your ideas will overlap with others, but at times, a written work can end up being part of a corrective or competitive game, rather than an original expression. Yes, I agree with your comments re interference, and for me at least, I would add intimidation. I hear a lot of people going on about all the bad writing out there, but for me the threat comes from the really good stuff; the ‘Infinite Jest’ and ‘The End of the Affair’ level stuff; the kind of stuff that makes you suspect you will never do what they did with writing. I see what you mean. Best of luck with your writing and future publishing. Thank you my friend. Good luck to you also. Thank you, your attention and conversation are much appreciated. Have an awesome day.